Spanning no less than five generations, this is the story of a Midleton-born nurse who rises to the top of her profession in the 1960s before marriage to a carpet salesman in Clery's sees her having to leave her job and become a fulltime mother. Her relationship to her parents, her grandparents, her siblings, her children and her friends are documented in an event-filled saga that's as much a history of the time as of its characters. Tragedy mixes with comedy as tales of marital breakdown and a bullying matron mix with nights on the town and days on ever-changing wards as the health service goes through various transitions and she does her best to acclimatise herself to them. Allied with her attempts to juggle her career with the demands of a challenging home life resides a bittersweet tale of love and loss as the winsome world of her parents gives way to a harsher one where family values are threatened by the addiction problems of her husband and daughter. Behind it all is her unmarried aunt who hides a heartbreaking secret that flies in the face of the morals of the time. 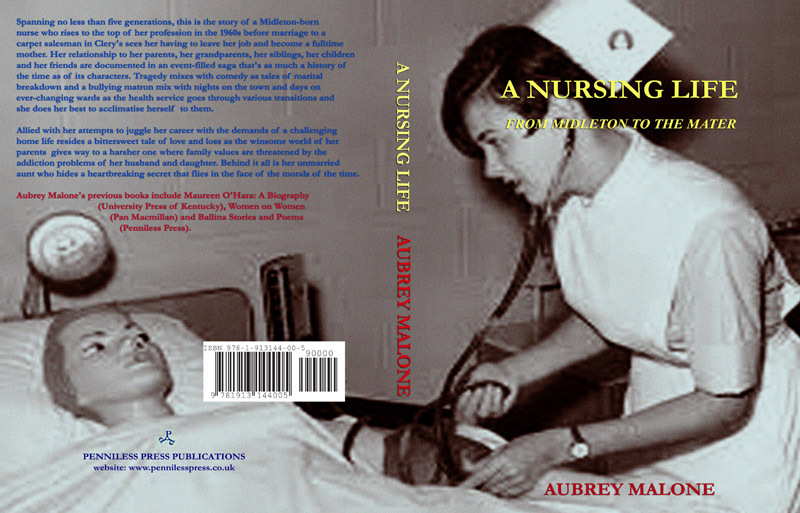 Aubrey Malone's previous books include Maureen O'Hara: A Biography (University Press of Kentucky), Women on Women (Pan Macmillan) and Ballina Stories and Poems (Penniless Press).